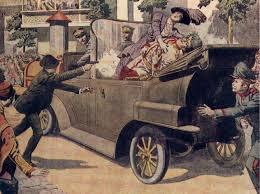 The shot that was ultimately to start the First World War rang out in Sarajevo, Bosnia on 28th June 1914. The assassination of Archduke Franz Ferdinand, heir to the throne of the Austro-Hungarian Empire, was to precipitate a war that few could predict when the news first broke. Few original Saracens Club records exist from this time. But it is hard to imagine that the closely-contested Surrey v. Middlesex 3-day County Championship match at the Kennington Oval did not attract as much attention from Saracens rugby players on their summer break from the sport as did the disturbing news from the Balkans. Middlesex, the home county of many Saracens players both then and now, secured a fighting draw in the match, after being forced to follow-on by Surrey. No one playing or watching this match could have then believed that, following an appeal by W.G. Grace on 27th August in ‘The Sportsman’, cricket would be abandoned “in deference to public opinion” and that cricket, like rugby, would focus its efforts on the rapidly ensuing war in Europe.